A Critical Look: Horizon Bought Hobbico... Now What? It's official: Horizon Hobby placed the winning — and as far as I can tell, only — bid for Hobbico's radio control assets, including Axial, ARRMA, Dromida, Top Flite, Great Planes, Carl Goldberg, and more. 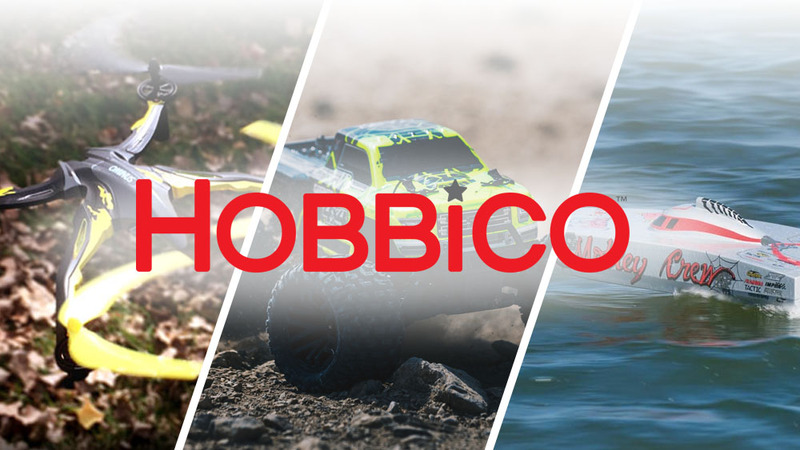 The hobby world has been in a state of flux since the announcement Hobbico was entering bankruptcy, and this new development doesn't make things any clearer. Let's break down what we know, what we don't, and what we hope to see going forward. Truth be told, we don't know much. Most of the information contained herein comes from a phone conversation with our Horizon Hobby Sales Rep, so it's at least from the horse's mouth, but most of what we discussed are things thus far unsettled, so it's hard to make any concrete determination. Let me be clear: we are looking at mostly rumors and preliminary discussions — but there are a few things we do know. First, Horizon has no intention of running Hobbico as a separate entity. The assets of Hobbico will be absorbed into Horizon Hobby proper, at which point people within Horizon will determine the fate of those products and brands. It's pretty safe to assume Axial will be kept around, but some Axial products could conceivably go away — especially where there is overlap with something Horizon already does. We can be fairly sure that some — if not most — of the Hobbico's staff will be losing their jobs. It wasn't clear if Hobbico's warehouse and headquarters were part of the deal, but even if they were, it's silly to think Horizon would operate two distribution centers within the same city. Where there is overlap, those people are likely to become unemployed soon. Finally, we know the sale is pending court approval, though there is little reason to think the court will block the sale. Furthermore, should it be approved, the deal will close on April 6th, 2018, at which point Hobbico's assets become Horizon's. What we don't know about this sale could fill a thousand of these articles, but let's hit the high points. What will happen with Tower Hobbies? I asked this point blank, and the answer was unsatisfying. They don't know. Current thinking seems to be Tower's website will be operated side-by-side Horizon's own online store, and they will carry similar, if not identical, items, but as I mentioned before, no plans have been finalized, and this is a combination of a little bit of solid information and a lot of speculation. What about Futaba? I was surprised to hear that Horizon is in talks with Futaba about possibly importing and distributing the radio brand in the United States — Horizon owns Spektrum, after all, the primary competitor to Futaba. I'm not sure who is courting who here, but the result of the talks will be very interesting indeed. What does Horizon do with ARRMA? This is a short one: no idea. My rep didn't have any insight at all into how ARRMA will mix in with Horizon's RC brands. Furthermore, we don't really know how the acquisition will effect Horizon's own brands. Will ECX go away? Will Vaterra ride off into the sunset? What about Losi's vehicles that are in direct competition with Axial's? None of these things are even remotely settled, and until then, Horizon's not saying anything. Other hobby-shop specific questions are also important. For instance, Great Planes (the distribution arm of Hobbico) sold Testors' paint individually — we could purchase only what we needed to fill our racks. Horizon only sells Testors by the case, usually six or twelve jars of paint to a case. For shops like ours that cannot afford to have all that money wrapped up in paint, purchasing from Horizon could be painful. Will they adopt Great Planes' practice of breaking up case quantities? I wouldn't hold my breath. Other general hobby items are also MIA at Horizon, like K&S Metals. We sell a reasonable amount of music wire and brass tubing, but Horizon doesn't carry it, so we've been buying it from Great Planes. Will Horizon pick the brand back up or will our supply of specialty metals become rarer and harder to get? How about kites and puzzles and paint-by-numbers? We don't know, and that's sort of scary. How long will it take for Horizon to start selling Axial products? What's going to happen to Dromida? Will backorders at Great Planes be honored at Horizon? What about the stores that didn't have a partnership with Horizon — how will their businesses be impacted, and how quickly will Horizon get them up and running as a Horizon dealer, should they want to be? There are literally tons of questions swirling around this industry-defining moment, and no solid answers for any of them. Ideally, I'd like to see someone else purchase Hobbico and continue operating them as if nothing had changed, but now that Horizon's ownership of Hobbico's assets are all but certain, it's too late to worry about that. Instead, here are the things I'd like to see out of this deal. Allow me to put on my rose-colored glasses and be optimistic for a moment. I think ARRMA's vehicles could replace ECX's. The 1/10th scale ARRMA trucks are, at their core, better vehicles than ECX's core line, and the 1/8th scale ones would be a great fit for Losi. I don't think I'd keep the ARRMA name, since I think it's stupid, but rebranding the ARRMA vehicles under Horizon's labels, and supporting them with a ton of hop-ups, could be a solid substitute for the Losi line-up I envisioned in my last column. I think Vaterra's Ascender should be rebranded under Axial's name and Vaterra itself retired. The on-road cars could be shoved into the Losi catch-all, if they need to exist at all. Axial should be left to work without much intervention from Horizon's other branches; of all the brands they picked up, Axial is easily the best one, and they have shown they know how to make crawlers. Discontinue the stuff Axial never should have made in the first place, like the Yeti, Yeti Score, and Yeti XL — Losi's similar vehicles are better and Axial should just focus on rock crawlers and only rock crawlers. I'd like to see the new Dromida drones folded into Horizon's Revolution line, and perhaps even discontinue the existing drones as well. Love 'em or hate 'em, Dromida's drones are better than what Revolution has right now, and are more fixable to boot. They shouldn't be left on the cutting room floor. I don't much care what happens to Dromida's surface line, since the Revolution offerings are basically the same thing, and sales in the 1/18th scale category have been declined rapidly over the past few years. Aircraft-wise, Flyzone is a lost cause — let it die. Ditto Heli-Max, if they are even a thing anymore. In fact, you can add Aquacraft to the list of brands that don't have to continue on past April 6th. In each case, Horizon has a competing brand that offers better products, so there's no need to continue making bad ones. I'd like to see some of the Duratrax line merge with Dynamite, like the car stands we sell quite often. I'd also like to see the Great Planes line of hardware continue on, maybe under the Hanger 9 name, or even E-Flite. Top Flite is too iconic to kill, but I'm not sure how relevant they are these days, and I don't much care whether it's Monokote or Ultracote that wins the covering battle, but one of them should. I'd love to see Horizon pickup more general hobby products, like plastic models, paint-by-numbers, puzzles, and the like, and I'd be super happy if they let us buy Testors paint by the jar instead of by the case. I think the Hobbico practice of publishing tons of information on Tower for every product should get absorbed into the Horizon Hobby web team, and I'd like to see Horizon strike a deal with UPS instead of Fed-EX, since our shipments would get here a lot earlier in the day. There are probably more things I'd like to see, but there hasn't been enough time to wrap my head around it all. I can't say I'm enthusiastic to see Hobbico's assets end up in the hands of their only real competition. I've already heard people throwing around the "monopoly" word, and while i think that's a step to far, I am certainly concerned we will see a marked increase in prices across the board. When asked what assurances we had that Horizon wouldn't act like a monopoly, I was told "None". This doesn't engender comfort, and we can only hope Horizon will hold to the standards they've kept for years and not succumb to the temptation that comes when you're the only major player in town.